Shop Fox - Ball Bearing Slides - 22"
For the ultimate in drawer hardware, these Full Extension Drawer Slides support up to 100 pounds and feature multiple ball bearings for smooth operation. 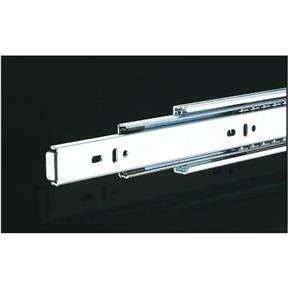 These Full Extension Drawer Slides measure 22" x 1/2" x 1-3/4" and include left and right-hand slides. These slides were better than I had hoped. They hold an amazing amount of weight in the cabinets I built for my workshop. Excellent product.... quick delivery.... easy to install..... BEST price available and even better when ordered in bulk. Installed easily. Someone got a little carried away the grease. Had to clean them all before install.